This forum has been a wealth of information as we go though this house build, thank you all. Now for the question at hand. I am thinking of a generator transfer switch near the main panel. I am looking at units that put the switch between the panel and selected loads. I want to power the well pump, hot water heater and selected lighting and power circuits. The two most interesting are the Generac and Reliance, both 10 circuit. The Generac uses normal circuit breakers to replace the breakers in the panel which are removed. A main switch is used to select mains power or the generator and individual loads can be switched on and off. The Reliance unit places switches between the panel breakers and load to select generator or mains. The reliance is about $50 more. Anyone have any experience with those units? If you are talking manual transfer switches.....get a 200A one, and switch the whole dang panel! Then....you can use whatever you want. That is how my house is setup. It is outside, next to the meter. There is a conduit ran from the transfer switch to the shop, where I can plug my generator welder in. WORKS GREAT! You can use a smaller generator just to run lights/tv/etc. Then if your wife needs to cook, laundry/whatever....use a bigger one. That is what I do. I can get a 200A manual service rated transfer switch for $500.00 last I checked. The best way to go! If your service is bigger....they make bigger switches also. Or are you wanting a autostart up deal? Manual start. I have to drag the generator from the shop to the house, hook it up, then start it. I have a 20KW generator with auto start and an automatic transfer switch but the control board is fried and I cannot find either a schematic or get someone to repair it. I have the reliance with 6 circuits. Use two for water pump. The other four cover freezer, refrigerator, kitchen lighting, and furnace. Just enough to cover emergencies. Have outside plug for my 8000 watt generator. Have not needed to use it yet. It was fairly easy to wire. and the generator started automatically. I stopped it every 8 hours to check the oil level. My neighbors were calling to see why I had lights. Same thing here- REA put in the transfer switch and local electrician put in the bottom box where I plug in the alternator cord. REA will disconnect anyone without an approved transfer switch. I have a 25/45KW pto unit......D17 or larger can run it fine, but when we had the dairy, alt couldn"t run everything at once. Didn"t need to either. I have a 19K Onan unit. It is out by the shed in its own building. I have to start it manually (diesel) but the transfer switch setup does the whole farm. I haven't ever overloaded it. I got a new HVAC unit and they told me to flip the breaker on it. It has a DC blower and if I run it on generator power it voids the 10 year warranty. I just use about 4 space heaters. Not sure on the brands, but I had a Generac RV unit. It was a pain. Leaked oil after just a few hours. Support for them is limited as well. I would avoid one of those if it were me. Check your water heater and furnace to see if they will run OK on generator power. The type you describe is good but recognize that after the first power outage you will have the electrician back installing a second one to include the things that you didn't realize that you needed. I really like the type that I have, that consists of an additional breaker to switch the generator power, and a sliding lockout that makes it impossible to have both street and generator on at the same time. I can run every circuit that I have including electric dryer. I just have to be judicious about it. Just switch the entire panel. These people proud of their generator running four or six essential breakers are daft. And for the love of $50 measly dollars, you have to be kidding. Electric water heater? The first thing I would do would be to replace that heater with gas or propane. It's going to use up almost all your generator capacity. 10 circuits? Each 240 circuit takes up two circuit breaker slots. So well and water heater use two each; central air would take another two. If you already have separate main disconnect and main lug panels, replacing the main disconnect with a transfer switch as suggested by B&D is the simplest and best way to go. While there are indeed more then one legimitate and perfectly code compliant methods, my preference as an engineer was to use the simpler method where the Transfer Switch selected EITHER the Utility to feed the homes exisitng Main Panel ORRRRRRRR the Genset fed the exisitng Main Panel.....Its so easy to switch ON ONLY the loads you wish to use and the others OFF when the genset is the selected source of power if it lacks capacity to power everything. The Main Panel receives power FROM THE TRANSFER SWITCH (NOT the Utility as normal) ,,,,,,The Switch is wired to TWO possible sources, the Utility orrrrrrrrr the Genset. PIECE OF CAKE TO WIRE AND USE AND no rewiring or reconnecting some loads one place or another ALL LOADS ARE ALREADY FED FROM THE MAIN PANEL AND IN PLACE simply turn a few off as/if necessary. ALSO you only need to use a TWO POLE TRANSFER SWITCH and you DO NOT have to switch the Neutrals PROVIDED the Genset isnt configured as a Seperately Derived Source!!!!!!! Still there are cost considerations and convenience and other factors where another method may work best in ones own particular situation SO TAKE A LOOK AND SEE and consult local authority and utilitly and professional electricians and engineers!!!!!!!!! You can go here and see the type that Showcrop is talking about. And or do a search for breaker interlock generator transfer switch. Most panel manufactures now have them for their panels for much less. Available through most big box stores. The breaker in the Generac is unique to that equipoment and very expensive if it needs to be replaced. I have an 7000 watt, 8000 surge generator. We lose power from time to time. 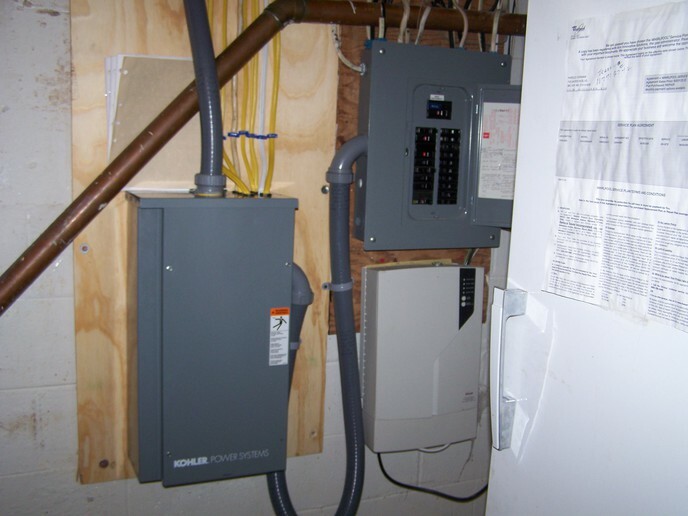 I put in the reliance transfer unit with 1 240 transfer switch and 4 120 volt units. I have a good potion of my house powered with it. Wife and I are quite happy with it. Necessaries are powered, power at most has been out for about 5 days, Minor inconvenience at the most. Would definitely recommend the unit.